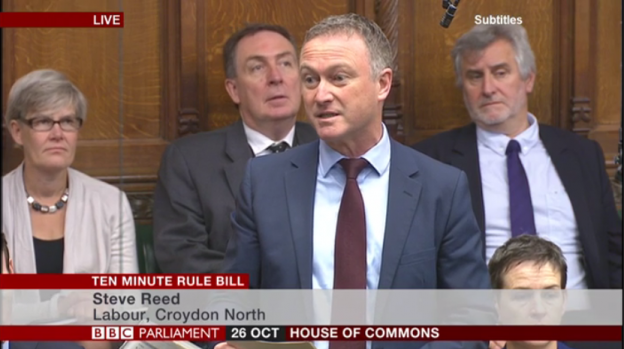 The House of Commons has backed Steve’s Ten Minute Rule Motion, which will allow him to introduce his Maternity and Paternity Leave (Premature Birth) Bill. The Bill aims to extend maternal and paternal for parents of premature babies. Second Reading of the Bill, where MPs will debate the full proposals, will be on 16 December. The campaign for the law change has been led by Croydon resident Catriona Ogilvy. You can sign Catriona’s petition backing the change here. You can read and view Steve’s full Ten Minute Rule Motion speech to the House of Commons below. That leave be given to bring in a Bill to amend Part 8 of the Employment Rights Act 1996 to make provision about maternity and paternity leave for parents of babies born prematurely; and for connected purposes. Having a premature baby is one of the most traumatic experiences that any parent can go through. Instead of bringing home the healthy baby they had longed for, their tiny baby is put inside an incubator, fighting for its life, surrounded by tubes, wires and bleeping monitors. Instead of holding their baby close, these parents can only watch as their baby struggles to breathe, dependent on life support and intensive care. This can go on for weeks and months before a baby is well enough to go home. The stress, anxiety and worry lead two in every five premature mums to suffer mental ill health. Parents fall into debt from the unplanned expense of daily journeys to hospital, overnight accommodation or eating in expensive hospital cafes. One mum told me her baby spent three months in intensive care, and that time was all taken out of her statutory maternity leave. So her baby suffers twice: first, from the serious health complications of being born too soon and, secondly, from having less time at home with mum and dad—vital bonding time that can affect a child’s development for many years to come. I spoke to another mum who told me that once she had gone back to work, her employer would not give her the extra time off she needed to deal with her premature child’s frequent illnesses. She lost her job, and her family lost that vital extra income. I spoke to a dad who had to go back to work the day after his baby was born three months too soon and was fighting for her life in an incubator. Most people would agree that his family needed him more at that time than his employer did, but the law did not give him the support he needed to be there with his family. We should give the parents of premature babies all the support they need to cope at one of the most traumatic times they will ever experience. I pay tribute to a Croydon mum and tireless campaigner, Catriona Ogilvy, who started campaigning on this issue after her two beautiful little boys were born prematurely. Over 100,000 people have already signed her online petition. I should also like to recognise the outstanding work of the charity Bliss, which campaigns for the rights of premature babies and their families. It is time the law recognised the special needs of premature babies’ parents by extending their leave so that they can give their vulnerable, tiny babies all the love and care they need and deserve. This measure commands growing support in the country, it is the right thing to do, and it deserves the support of this House. That Mr Steve Reed, Norman Lamb, Heidi Allen, Chris Philp, Wes Streeting, Dan Jarvis, Stella Creasy, Mr Gareth Thomas, Jenny Chapman, Lyn Brown, Heidi Alexander and Lisa Nandy present the Bill. Mr Steve Reed accordingly presented the Bill. Bill read the First time; to be read a Second time on Friday 16 December, and to be printed (Bill 81).